‘Arthur’s Tree’ was created with 26 pupils from Tongwynlais Primary school. We had a fun morning spraying the grass and using sponges and brushes to create butterflies and flowers. The project was a follow on from the work I did with RSPB on the ‘Grow Wild Cardiff’ campaign last year. The mural, created in time for visitors to the Fforest Farm open day to enjoy was created with the aim of engaging local residents in events taking place at the conservation centre. 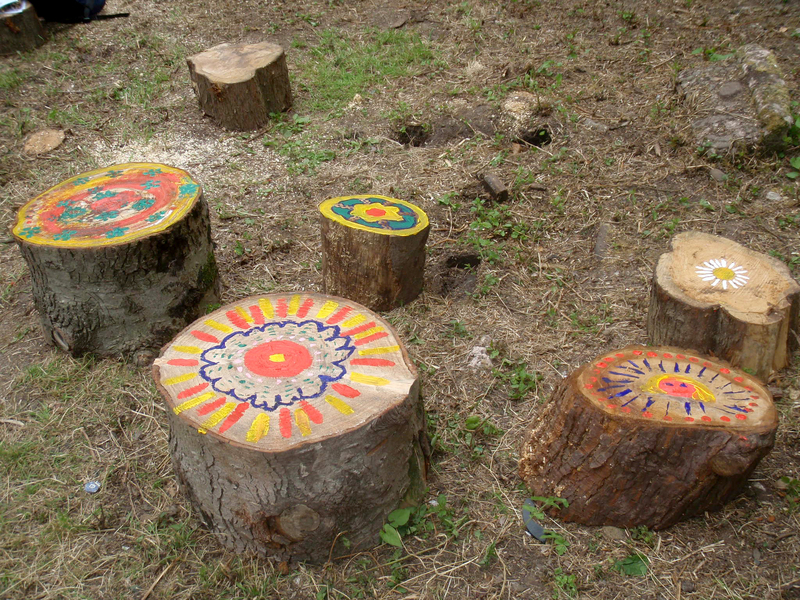 Visitors at the open day were able to contribute artwork to logs which will be used as seating around the area, as well as doing activities with RSPB and the Rangers team including bug hunting and creating cute little ‘natures palettes’. This project was supported by the Cardiff Parks Ranger Service and the Tongwynlais Our Neighbourhood group, who operate a Time Credits scheme in my lovely village. It was really lovely to link the school up with the Fforest Farm Conservation Centre which has some beautiful places to explore. 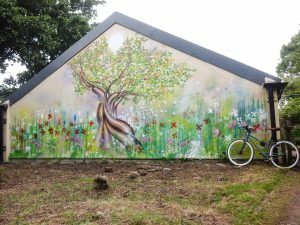 What was really special about the project is that I did a workshop in the school’s foundation phase about three years ago, with the same pupils, so it was a really nice follow on to do this mural with them.